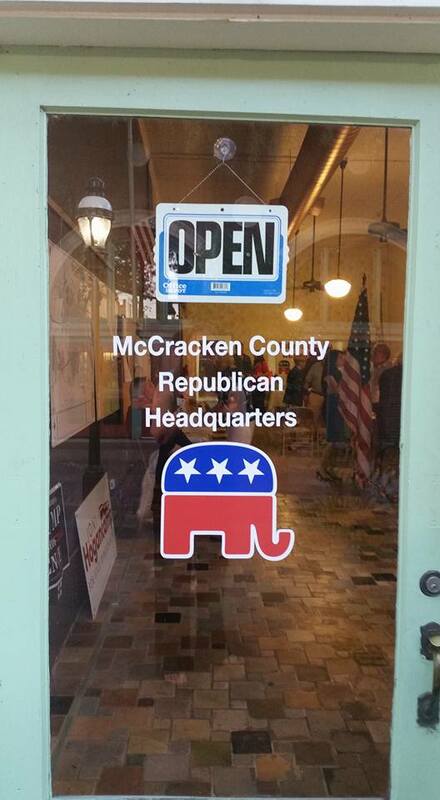 A very BIG thanks to all our local volunteers to helped work the McCracken County Republican Headquarters this election season. And another BIG thank you to everyone who stopped by and/or purchased Trump gear and/or obtained yard signs for our other local candidates. Thank you to those who provided spots for the large signs! The Trump gear that we sold was used to help our other local candidates in their races. We supported fundraisers for candidates in the form of organizing, attending, advertising. We hosted two viewings of the film “Hillary’s America” and DVDs. We had showings of several various other films at GOP headquarters. We hosted several candidate rallies. Yard sign placement in key areas of the county. GOP headquarters will reopen at an unknown location during the next election cycle in 2018. Until then our Executive Committee will be working behind the scenes to assist candidates in the next election. If you are considering running for office on the Republican ticket contact one of our executive committee members to learn how we can help.